Being on top of today's color trends keeps your jewelry stylish and fresh. And there's no substitute for great color. You can be a brilliant designer, but if your color is weak, so is your jewelry. 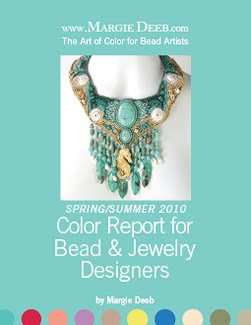 Because it's based on Pantone's fashion color report of the season, the Spring 2010 Color Report for Bead & Jewelry Designers connects beading to contemporary fashion forecasts and trends. No one knows and explains color like Margie Deeb, author of The Beader's Guide to Color. Her latest book, The Beader's Color Palette, was named the Best Craft How-To Book of 2009 by the prestigious Library Journal. If developing your color artistry is more your goal than fashion-forward thinking, download the Spring 2010 Color Report for Bead & Jewelry Designers and get inspired by color harmonies you've never seen. You'll have 10 new ideas by page 5! And you're work will take an exponential leap in creativity and originality. 23-page PDF pages of palettes, descriptions, photos, and color suggestions based on Pantone's fashion color report of the season. And revel in a gallery of jewelry inspired by the colors themselves. Margie will guide you through this season's colors and show you how to use them. 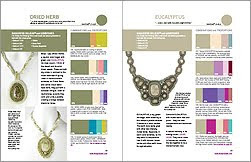 Color schemes that are daring, snappy, elegant, subtle, glamorous, and flamboyant... they're all in the Spring 2010 Color Report for Bead & Jewelry Designers. Benefits: -Seasonal inspiration for your contemporary designs -Forecast information designated by the individual PANTONE® Color # -Suggested gemstones, Delica® and Swarovski Component colors -Color swatches are referenced to the PANTONE for fashion and home color palette. Visit MargieDeeb.com and find your color sensibility. Great link thanks, I've bookmarked it to buy later. I own & love both of Margie's books, they are very inspiring!